PEST OF THE MONTH – SKUNK! Have you noticed dug up spots? Have areas of your yard or garden been dug up night after night? Did you know?! Skunks are excellent at rodent (mice, moles, rats) and insect control. Their omnivorous diet includes black widow spiders and scorpions, SNAILS & SLUGS, lizards, frogs, snakes, eggs and some plant materials, pet food. But they eat earthworms too, and skunks are one of the primary predators of the honeybee, relying on their thick fur to protect them from stings. The skunk scratches at the front of the beehive and eats the guard bees that come out to investigate. Being carrion eaters, they help keep roadways and neighborhoods clean. With their slow, waddling gait and bushy tail, these gentle mammals are delightful to see from a distance, and play an important role in keeping nature in balance – the natural way. However. 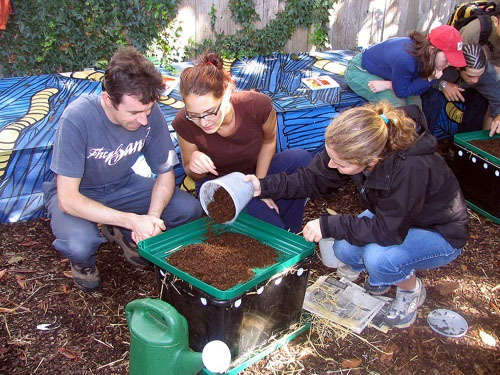 Several of us at Pilgrim Terrace Community Garden have had major skunk problems. Plants dug up, areas where seeds are planted dug up, earthworms eaten. Every night. Gets wearing. Cayenne pepper, the powdery type, that will get up their nose, in their eyes. Sprinkle it on the area the skunks are bothering. The animal won’t be permanently injured. Shake Away, an inexpensive form of fox urine available at feed stores. Moth balls in a container that will keep it from getting into the soil. Isn’t it ironic? 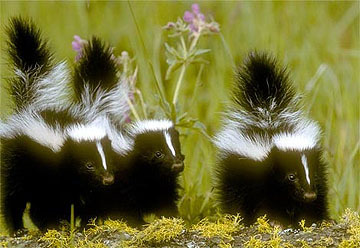 Skunks don’t like bad smells! Vary the deterrents so the skunks do not become used to them. Dan says the disadvantage of trapping is that as soon as one skunk is gone, another usually takes its place. Poisoning is not a good thing since other animals may ingest it or get it second-hand by eating an animal that has. I’m going to try a combo of moth balls because I think they will last longer, and pepper, as a backup. But it depends on which is the cheapest remedy overall. Let us know what has worked for you! Cute Hungry Skunks! Trouble Times Three!